Day three of the 2009 NYCC was much like the first two days -- busy! Not quite as insanely busy -- or as crowded -- as Saturday, but we were signing and sketching right up until we walked away from our tables for the last time. Here are a few images from day three. 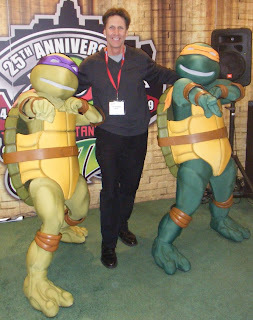 I got Mirage Studios CEO Gary Richardson to pose with two Turtles at the Playmates booth. 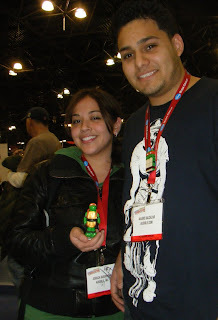 This very nice couple -- I believe their names are Jessica and Mauro -- stopped by and showed me two very cool Turtle items they had crafted. (The hand-painted thing on Mauro's necklace is either a flashlight or an MP3 player... I can't remember which.) Very well done stuff. Remember the "Munden's Bar" story that Kevin and I did way back when for an issue of "Grimjack"? No? Well, this gentleman did, and he was asking people who had worked on "Munden's Bar" stories to autograph this t-shirt, and I was happy to oblige. About an hour before we left, I finished this drawing which I was asked to do -- I think it is to be part of an auction to benefit the Inkpot Awards. 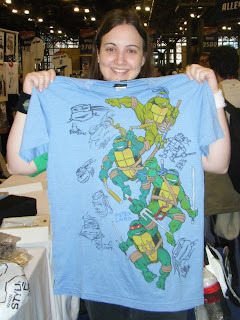 And the last thing I did before we left the show at 3PM was to sign this fan's t-shirt. I don't know why, but for some reason this time Steve Lavigne reminded me of Cousin Eddy from the National Lampoons Movie...I think it was his laugh and the hat that brought the image to mind :). Always fun talking to Jim, Murph, Steve and the rest. I'm busy uploading the full TMNT 25 Animation panel....and everyone there was a tease with the DTV project, with no real new information. :). 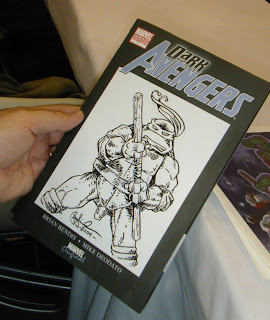 I just HATE, though, how every big reveal is saved for the SDCC...and not just turtle related stuff either. NY is a more high profile city with bigger media potential anyway :). Such a shame that you don't draw more than you do Pete. Glad you had a good time Pete. Cons are a good way to channel that ole creative energy. It's kinda like going to a rock concert. Thanks for signing my shirt, Pete! I loved seeing you guys! Your artwork is amazing and keep up the great work! Looks like you didn't miss much in the panel. Just a bunch of morons asking your Mirage colleagues old cartoon questions. I wish you guys would come out to the west coast, just once. -->> KAZZZZZZZZZZZZZZZZZZZZZZZZZZZZZ!! !! !! !! !! I just wanted to take the opportunity to thank both yourself and the rest of the crew at Mirage for the fantastic weekend and all the beautiful art work I got. I was wondering if you and the Mirage crew are planning on making it down to Heroes Con in June? Hey Peter, just heard the news about the TMNT films coming out on Blu-ray this summer. Don't know how much you had to do with this, but thanks!!! Hey Peter, just heard the news about the TMNT films coming out on Blu-ray this summer. Don't know how much you had to do with this, but thanks!!!"